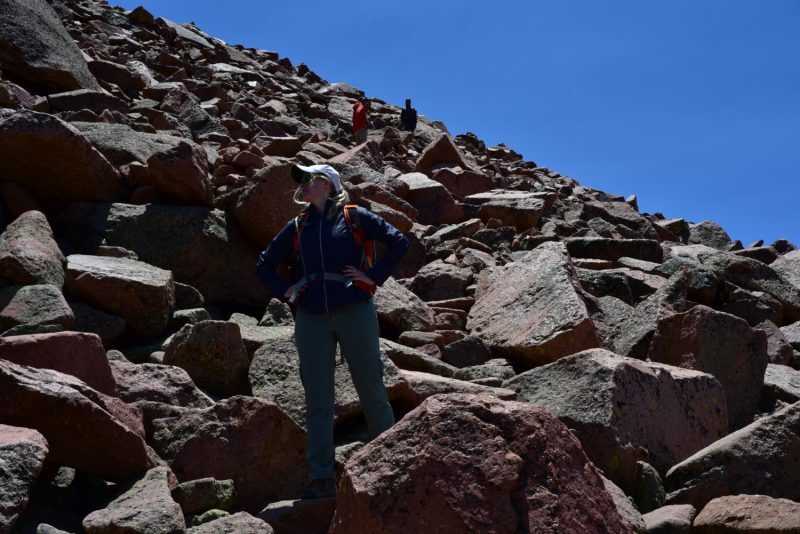 It was the Sunday evening before the 4th of July, and we were itching for another 14er to summit though we weren’t particularly eager for a long drive or car camp the night before. 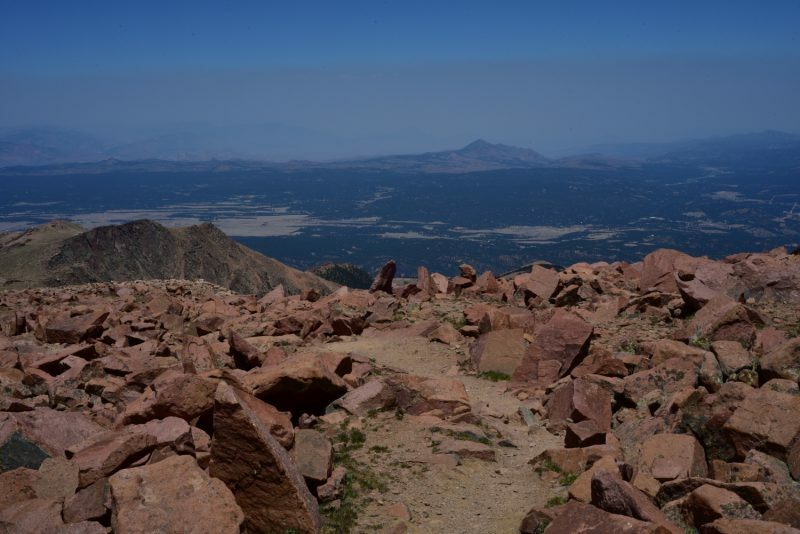 In our peak “bagging” project, we only have Longs Peak and Pikes Peak left in the Front Range, and for some time have contemplated letting our 14er finisher be Pikes Peak so that family and friends can drive up and meet us at the top. Well plans change, and we figured this was the only reasonable peak to get in this time while allowing us a little more sleep in the comfort of our own home. 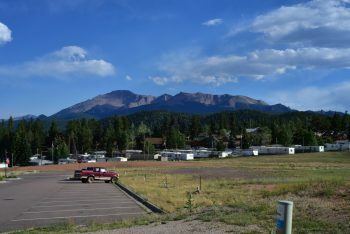 Bright and early…or should we say dark and early on Monday July 2nd, we awoke and made the 2 hour drive to the Crags Campground TH for Pikes Peak. 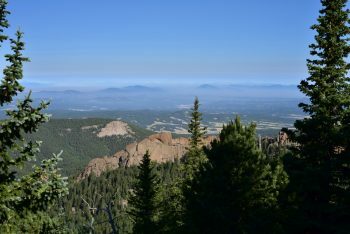 For those of you familar with Pikes Peak, you’ve probably heard of the famous Barr Trail that leads 13 miles up to the summit with over 7,000 feet of elevation gain. 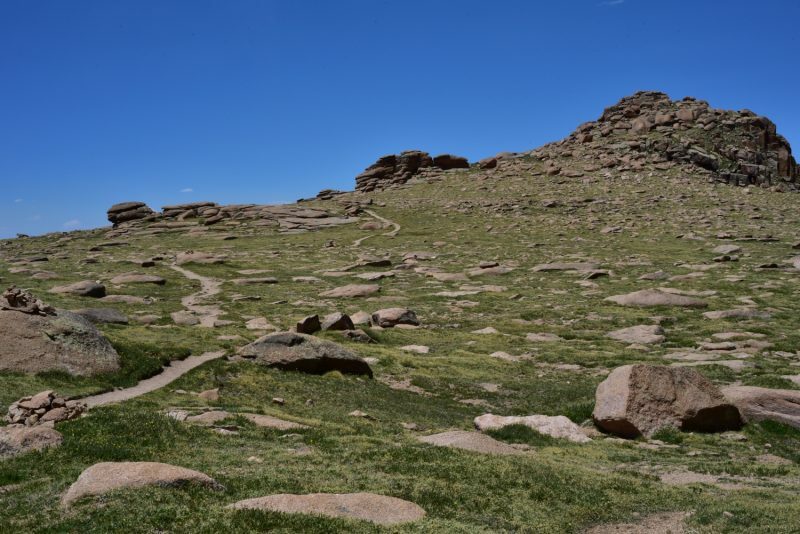 This is the standard iconic route that most people take and usually involves an overnight stay at Barr Camp about half-way up the peak. 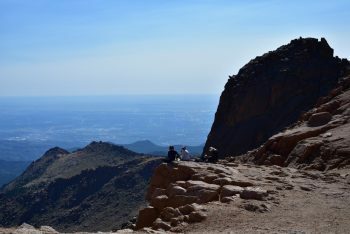 However, there is an alternative for those seeking to gain the summit of Pikes without such a long slog. 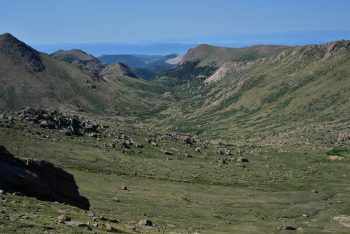 Less popular and less traveled is the Crags route, which begins near the Crags Campground located near Divide, Colorado. Round trip this route is a litte over 14 miles and gains roughly 4,100 feet of elevation. While still long, this route saves a lot of time compared to the standard 26 mile walk up. 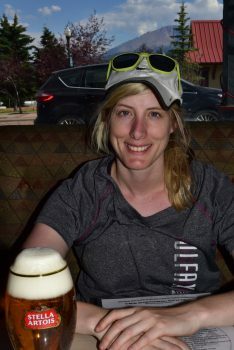 To reach the moderately sized parking lot and the start of the trail, we turned off of Colorado 67 near a ranch and drove for about 3 miles on a 2wd dirt road. The parking lot was nearly empty and there were vault toilets there as well. We began our ascent at about 7:20 am. 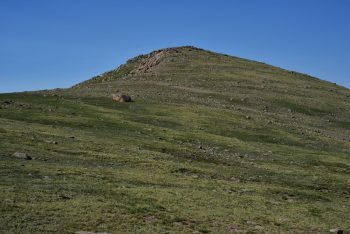 Though we had hoped for an earlier start time, the distance to reach the Crags TH from our home in Denver took much longer than expected. 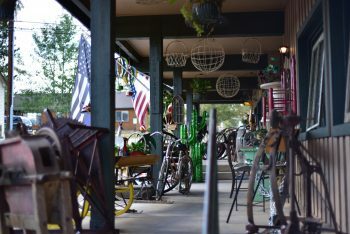 Plus, one of us needed a coffee/breakfast stop on the way there. We immediately crossed Fourmile creek on a nice bridge and began our trek through some dense forest. After about half a mile of moderately gaining elevation, we reached a trail junction. After reading trip reports, we were on the lookout for three “pipes” sticking out of the ground to mark the upcoming junction. We easily found the pipes but there were also nice signs indicating the junction. We followed the signs to Devil’s Playround towards the right. This portion of the hike was quiet, and peaceful. We passed two parties hiking up which always makes us feel great about our pace and accomplishment, however a trail runner later passed us quickly humbling us. The hike became much more interesting as the trees started to thin, opening up views of the exquisite valley below us. 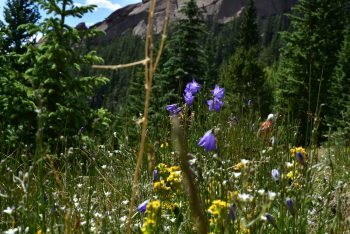 Close to 11,000 feet, we encountered a small meadow before ascending a steep hillside that exited the trees completely. 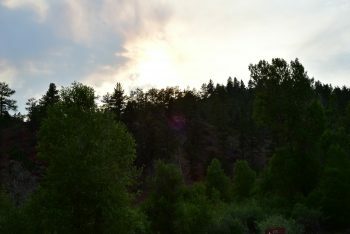 Seen below are photos as began to leave treeline. After ascending another steep hillside, we gained a ridge, and the trail leveled off a bit. 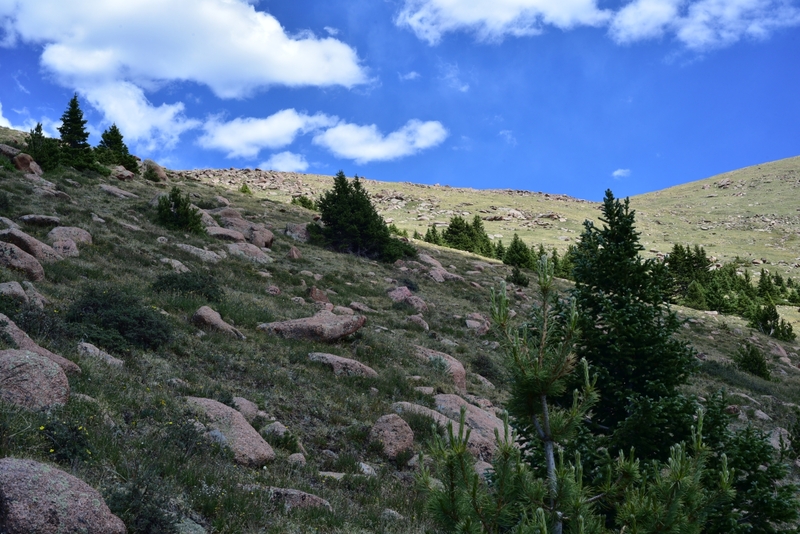 This portion of the hike was very reminiscent of the Mount Flora hike off of Berthoud Pass for those familiar. This is the quintessential alpine environment that we seek so frequently. 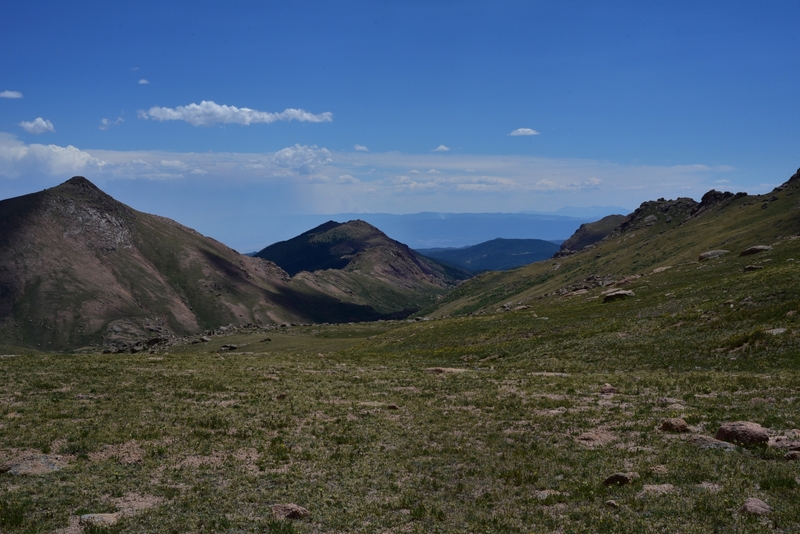 At the top of this slope, we were near 12,800 feet. We had gained close to 3,000 feet of elevation after about 3.5 miles. 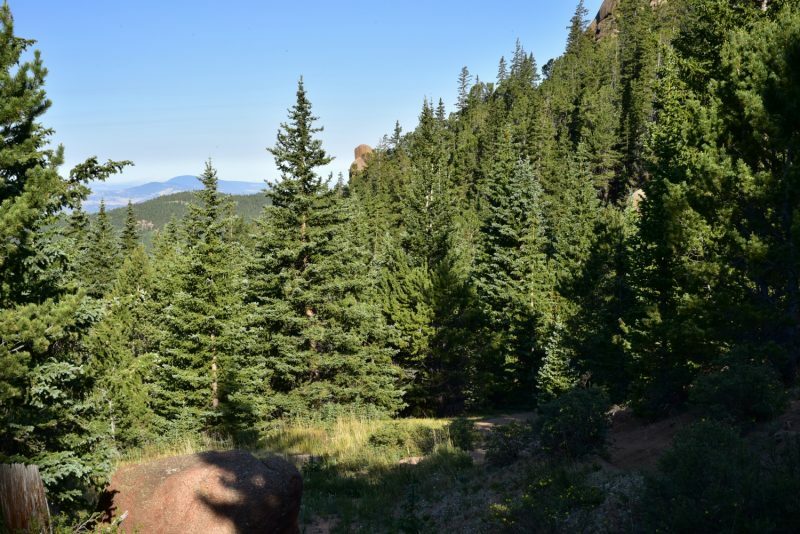 While beautiful, there were some steep sections in the first few miles of the Crags route. 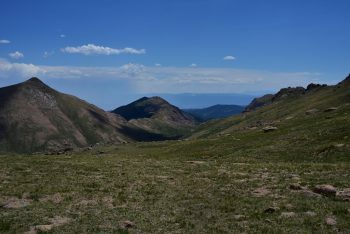 The trail widens here, and we followed it northeast towards Devil’s Playground and the Pikes Peak road. 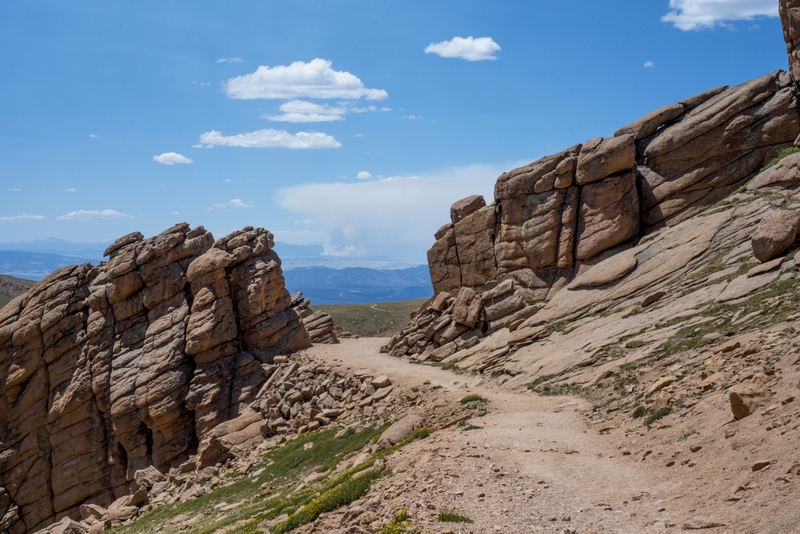 As we approached the “Playground” named for the frightening lighting storms that take place here frequently in summer afternoons, we came upon a large gap in a strip of rocks that we passed through to get to the Devil’s Playground parking lot. This entry point to the remaining route was quite dramatic. 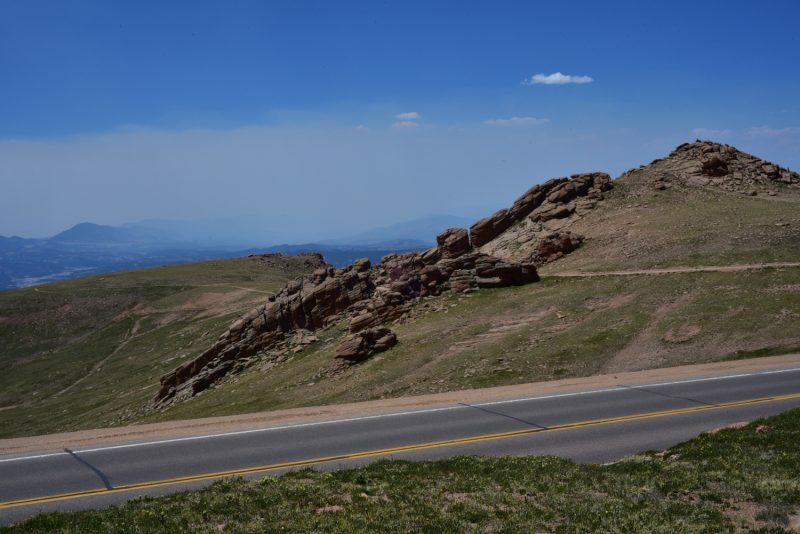 For our fellow Tolkien fans, we imagined Gandalf shouting “you shall not pass!” We passed though and were greeted with the first signs of civilization, and were reminded of why we have been putting off climbing Pikes Peak. 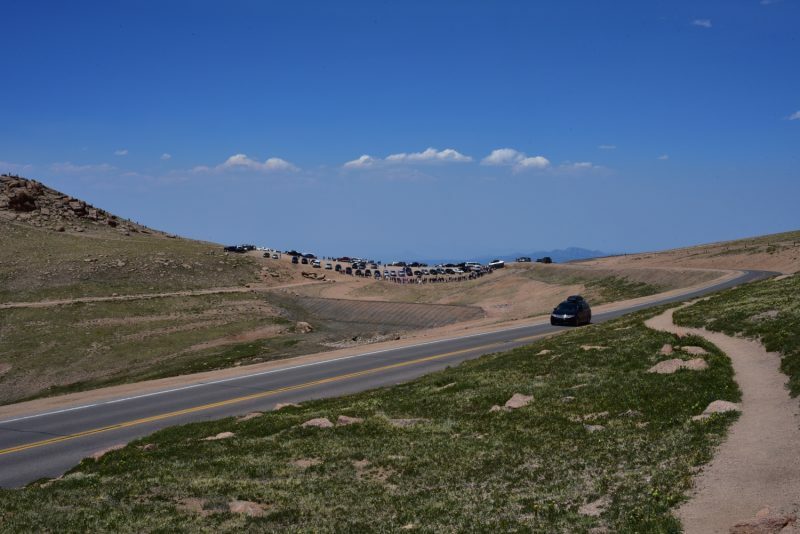 Because of construction at the summit house, there is currently limited parking on the top of Pikes. Shuttle bus operators were asking people without kids or disabilities to park at Devil’s Playground and ride up with them to save parking. 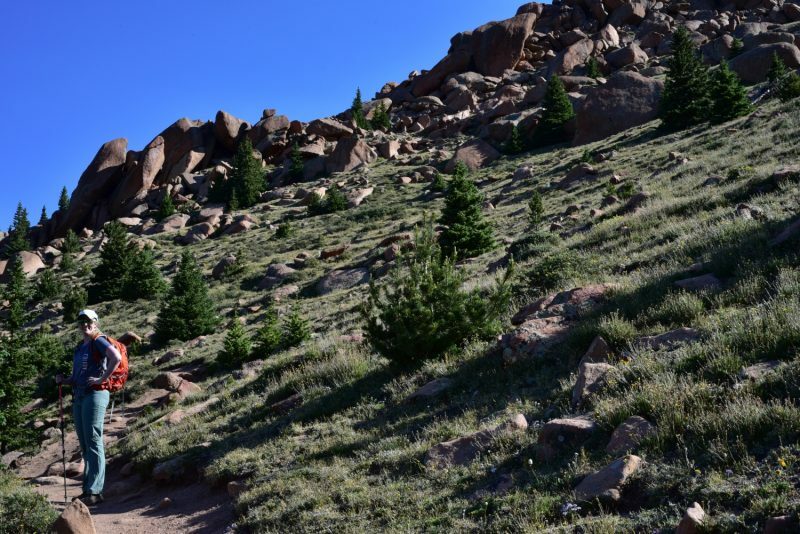 It was still relatively calm this early in the morning, and there were bathrooms which is rare for a 14er adventure above treeline. Nonetheless, the remaining route would be devoid of the privacy we were afforded in the first few miles. 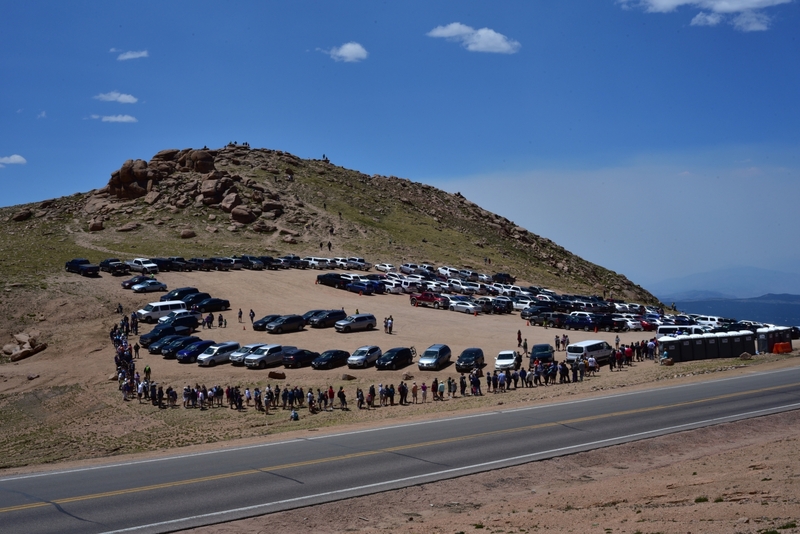 We crossed the Pikes Peak Road for the first time at the Devils Playground parking lot. 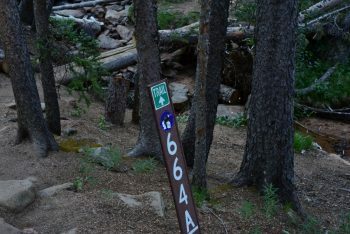 Hiking along the road is prohibited, and if you are caught then you are likely to get a ticket. 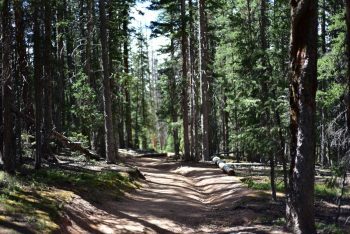 Instead, the trail follows the road for a portion, which in our opinion is much preferable to hiking up concrete next to vehicles flying by. We were now about 2.25 miles from the summit, and the trail was gentle until the final push. 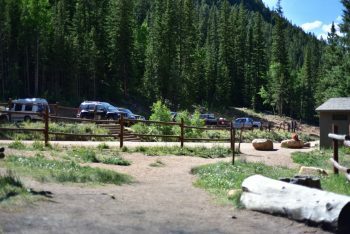 There were a few more hiking parties that had joined the trail for the abbreviated version at Devil’s Playground, but most people we saw were boarding the shuttle busses for the top. We enjoyed the mild terrain as we got closer and closer to the summit. Seen below are photos. The final push to the summit was much more entertaining than most of the hike. There was some easy class 2 scrambling fun as we picked our way up the remaining 500 feet. 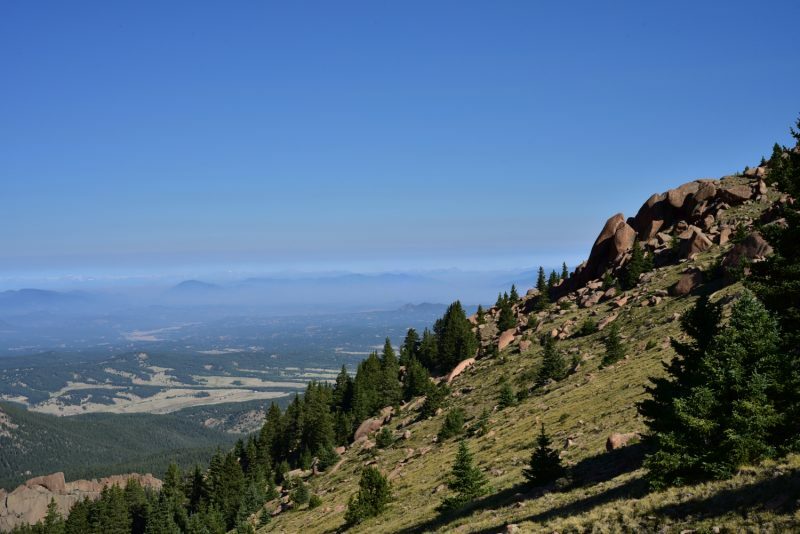 Once again we felt emersed in the wilderness as we hopped from boulder to boulder, the air feeling almost thinner we each new step. 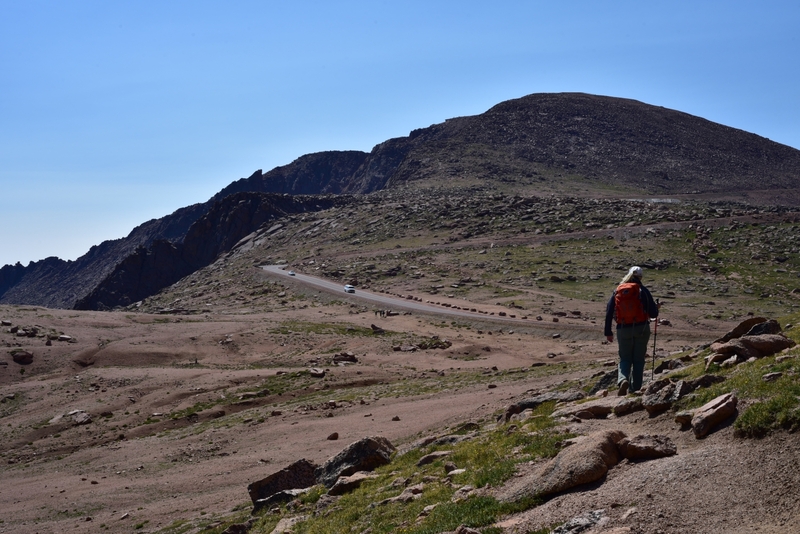 It was almost unnerving as we gained the summit and approached a large parking lot, hordes of people, and the summit gift shop and restaurant. 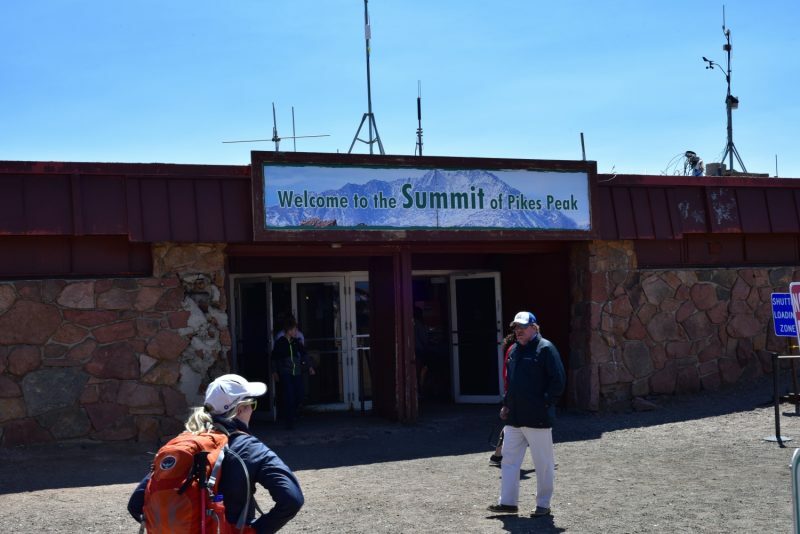 Nonetheless, we knew what kind of trek Pikes Peak would be and embraced the opportunity to refill our water, buy a few gifts for nieces and nephews, and eat some of the famous donuts and a grade school cafeteria style cheeseburger. We spent about an hour on top, eating, shopping, and taking video and photos from America’s mountain. 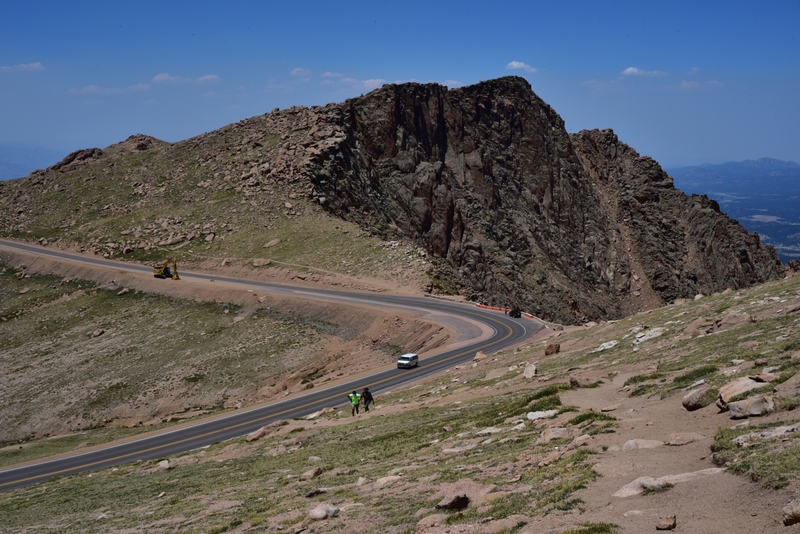 It was fun to see so many families of all ages together enjoying themselves at 14,110 feet. 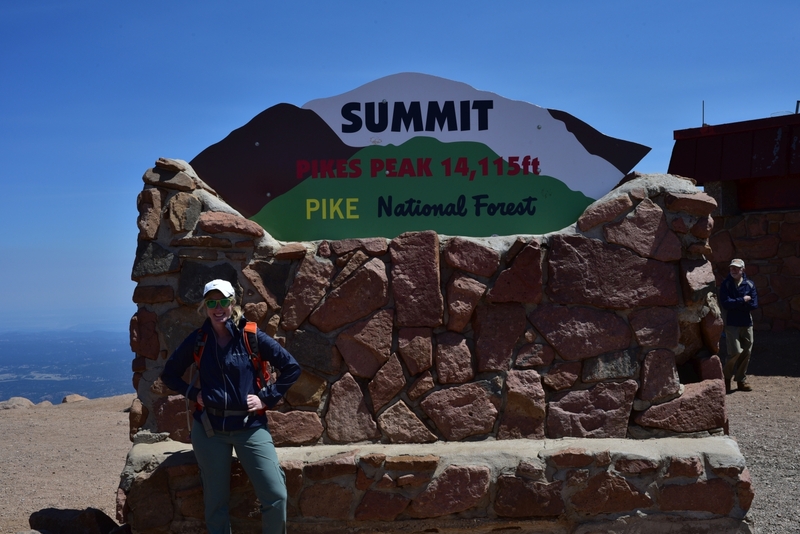 Or is it 14,115 feet…The summit sign states 14,115 feet, but through the years the elevation keeps getting changed. 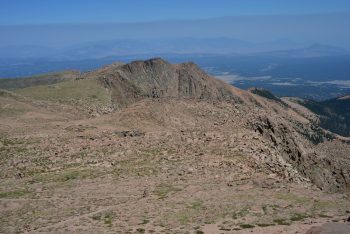 Originally measured 14,110 feet in 1929 and then there were some strange hundred feet increases from that when people tried to count the height of the summit house. When Congress adoped the “National Geodetic Vertical Datum of 1988” in 2002 and recalcuated peak measurements, it changed to 14,115. 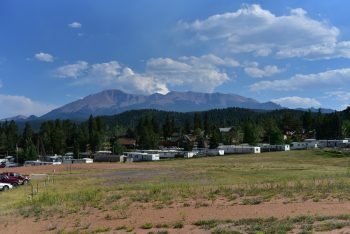 As far as we are concerned, it’s well over 14,000 feet but not close enough to contest the tallest peak in Colorado, Mount Elbert, so..who cares! Seen below are more summit photos. It was noon now and time to go back down. 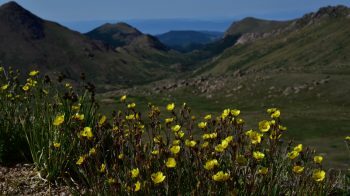 The weather was perfect, with barely a cloud in sight, however we understand how quickly this can change in the alpine. 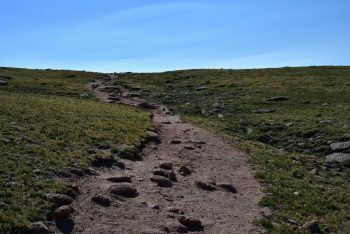 We followed our path back through the boulder field and headed for the gateway to solitude once again at Devil’s Playground. And we do mean gateway. At around 1:00 pm, there were hordes of people. 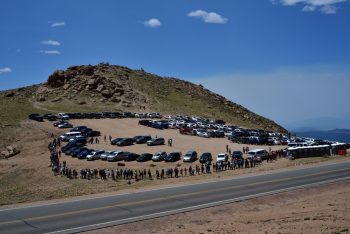 We estimated probably 100-15o people were in line to ride the shuttle to the summit. There were more people here than on the summit. 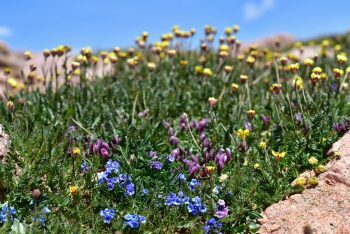 It was very satisfying to just keep walking away from the crowds back to the alpine splendor, even if it meant we had another 5 miles to the car. Seen below is the “gong show” at the Playground and some views from the way back down. 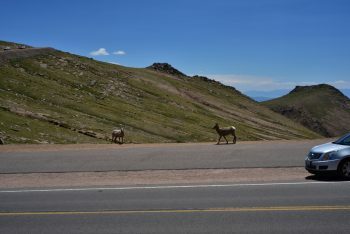 Of note, there were several mountain goats near the roadway on the way down. 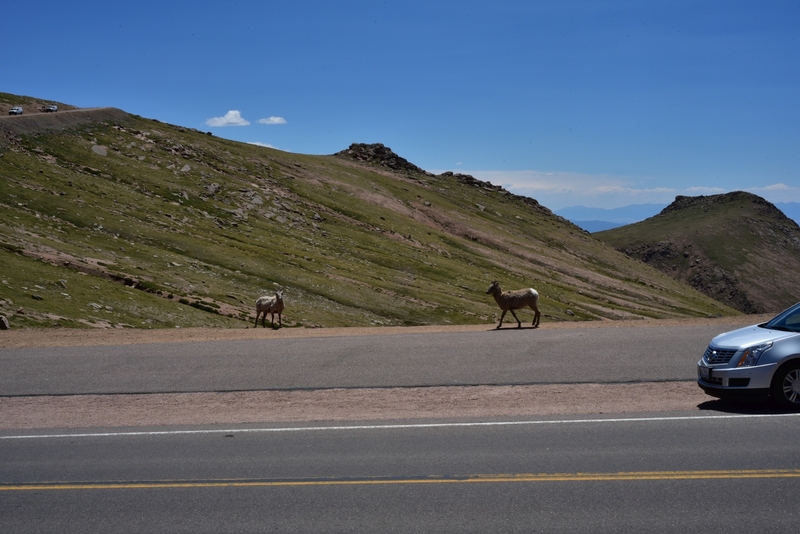 They stared us down intently as we hike down, and it was unsettling. We were a couple hundred feet away. Several cars coming up thought it was a great idea to pull up right next to them and shout at them from the windows which is not too cool. 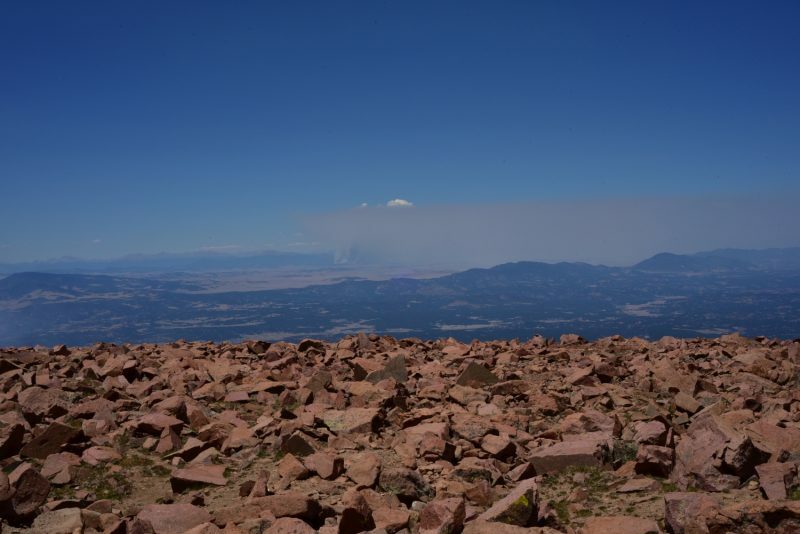 As we began the steep descent to the car, we noticed several large plumes of smoke from nearby fires. 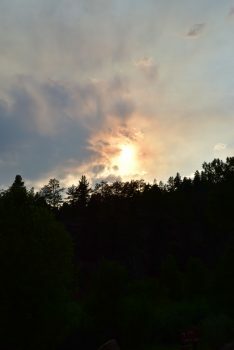 There is not enough moisture this year, and fires are sadly burning all over the state. 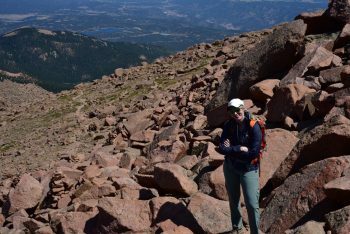 The descent proved more challenging than the ascent on the remaining trail. 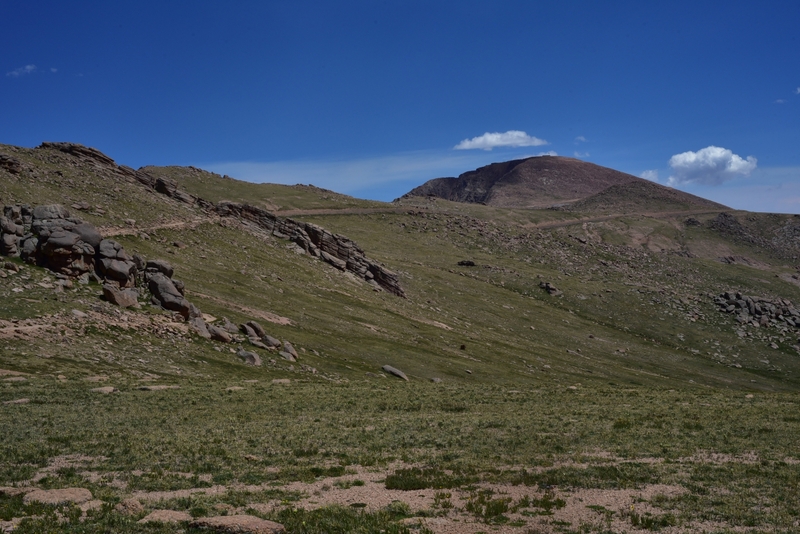 There were steep scree slopes that reminded us of hiking on a bunch of marbles. 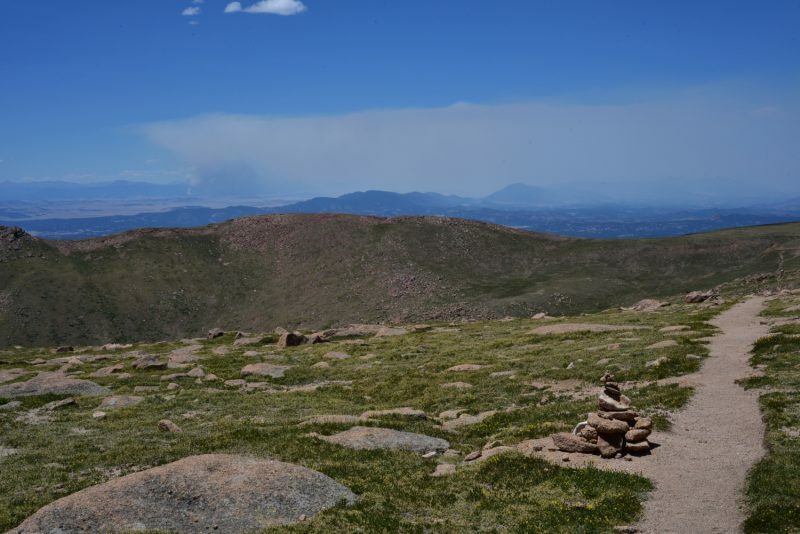 In fact, as we were resting and snacking near treeline, we encountered a member of the Colorado 14er’s Initiative. 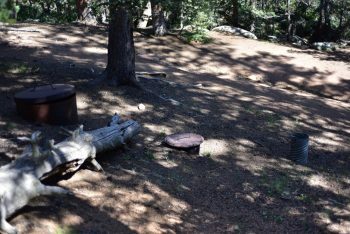 He had been scoping the trail all day and noting trail quality for future grants and improvement projects. 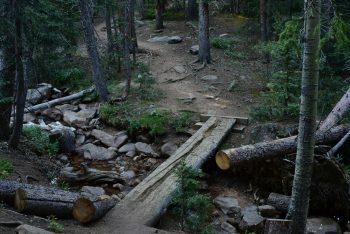 He pointed out that many areas of the this trail were in need of modification, and overall the trail was in poor condition. The remaining hike was uneventful, and we reached the car at about 4:00 pm after about an 8 hour day on the trail. We thoroughly enjoyed the day and hike much more than we expected too. 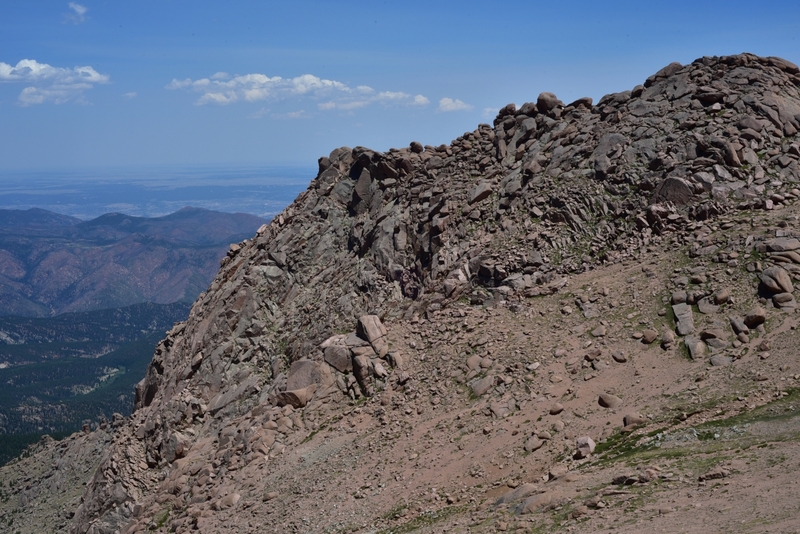 Prior to beginning this peak, we had some negative thoughts about the crowds and summit house and cars. But, it turned out to be a fun and unique high alpine experience. Not everyday do you get to enjoy a cafe on a summit. 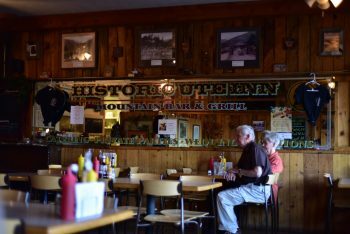 We finished the day in Woodland Park enjoying dinner at the Ute Inn which was quite satisfying after a long day. Rather than battle traffic in the Springs, we opted to take a scenic route home on 67 through Deckers and along the Platte River. It was quite tranquil, but took us way longer than expected. A detour ended up leading us up a steep dirt road with hairpin turns. Despite the long adventurous drive back we were happy to be together and thankful for another great day climbing and hiking in this amazing place. 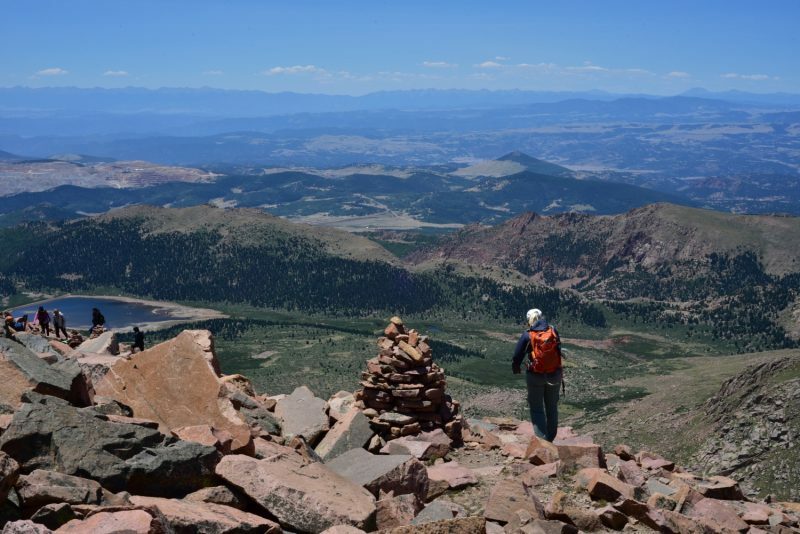 We are now getting close to the halfway mark of the CO 14er peaks. Until next time….enjoy some more photographs from the day.